Halloween is one of the most spectacular holidays of the year. Everyone gets to live out their fantasies. Adults get to be kids again, and children get to be superheroes or princesses. Whatever the case, everyone can be whoever they want to be without being judged. We get creative about decorating the courtyard and house, as well as crazy makeup. And if you thought dogs don’t like Halloween, think again. There are plenty of ways to ensure your Yorkie pup enjoys Halloween. This post talks about the best Yorkie Halloween costumes. For small size dogs like the Yorkshire Terrier, you’ll want to make sure that they aren’t overwhelmed by larger costumes. You can turn the most petite features into a pixie or go all out and dress your pup as a dinosaur. It is a universal rule that people feel like they belong together if they have similar costumes. Make your Yorkie part of the family by dressing him in a similar-themed costume. Safety should always be a top priority when choosing a Halloween costume for your pup. It shouldn’t have small parts that your Yorkie can pull out and ingest or choke on. Avoid anything that restricts visibility and mobility. Costumes with noisy and moving parts may stress your dog or make him uncomfortable. What is your dog’s personality? Does he love eating, protecting or exploring? Is he goofy and mischievous or bossy? All of these are important factors to consider when choosing a Halloween costume. Comic book hero and policeman are great costumes for protectors while pumpkins and hotdogs make good costumes for dogs that love eating. If you love the scarier and spookier elements of Halloween, you can turn your pup into a creepy, crawley spider. Rather than overwhelm your Yorkie, the utilizes its small size. It is scary, and made from 100% polyester. The Zack & Zoey Fuzzy Tarantula Costume is the perfect choice for someone who wants to be more authentic. It comes with eight bendable legs and plush fabric that resembles real spider hair. This gives the illusion of a real tarantula. The creepiest, crawliest, most hair-raising spider costume ever! Who said Halloween costumes have to be scary? 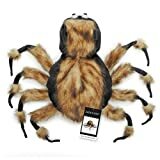 The BingPet Halloween Dog Spider Costume is quite adorable, made from polyester and features a Velcro attachment. It comes in two sizes, and is easy to put on. Size:S:Body length (not include the tail) is 10". Made from polyester fibre,soft touch and durable. If you are a fun of comics, dressing up your Yorkie in superhero themed costume this Halloween will be a blast. The best thing about this is that there are dozens of options to choose from. Our favorite pick is the Rubie’s DC Comics Wonder Woman Pet Costume. It features a red dress adorned with the Wonder Woman symbol. The blue skirt has white stars and a golden skirt. Also included is a headpiece with the Wonder Woman symbol. The Rubie’s Costume DC Heroes and Villains Collection Costume is a superman pet costume with the superman symbol. It also includes a detachable red cape to complete the look. The Rubie’s DC Comics Robin Pet Costume comes in five sizes. It includes an eye mask, red shirt with green sleeves and a detachable cape. Includes: Shirt With Detachable Cape And Eye Mask. This Is An Officially Licensed Dc Comics Product. Other superhero costumes offered by Rubie’s include Batman, Green Lantern, The Flash, Supergirl, Joker and more. It’s up to you to pick your favorite superhero. You can even choose couple superhero costumes like Batman and Robin or Batman and Batgirl. What dog doesn’t like food? If you are tired of thinking about Halloween costume themes, foodie is the best way to go. Available in multiple sizes, the Rasta Imposta Hot Dog Costume is a one body piece costume. Recommended for dogs 2-6 lbs. The Rubie’s Pineapple Pet Costume is a step-in bodysuit with tongue and hook closure. It looks incredible on Yorkshire Terriers, and isn’t overly constricting. A matching headpiece with elastic is also included. The Rubie’s Hotdog Pet Costume consists of a soft pullover bodysuit in the shape of a hotdog. It is available in multiple sizes, and a perfect choice for those who like coordinating Halloween costumes. This costume includes a hot dog shaped bodysuit. The Rasta Imposta Tootsie Roll Dog Costume includes one tootsie roll tunic. It is designed to last a long time and made from 100% polyester. The costume looks great on small dogs, including Yorkshire Terriers. The Rubie’s Costume Cupcake Dog Costume is made up of a cupcake bodysuit. The matching headpiece has pink ruffles and cherry on top. Talk about the perfect costume mastery! 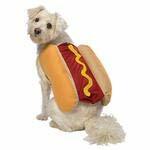 Other food Halloween costumes for dogs offered by Rubie’s include watermelon, tacos, cookie, pizza, popcorn, bacon, banana, condiments and burger just to name a few. I’m all for formality and elegance, and that’s why costumes in this class are so appealing. The Biling Dog Dress Tutu Skirt Flower Luxury Wedding Dress is made with high quality fabric and matching flowers. It is the perfect costume for turning your canine friend to a princess. The gold color is quite charming in the crowd. This costume is great for Halloween, Christmas, play dates, weekend parties and more. The Alfie Pet by Petoga Couture is a one-of-a-kind Oscar formal tuxedo that comes complete with a black tie and red bow tie. 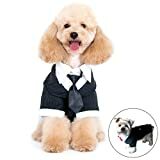 Available in multiple sizes, this costume transforms your Yorkie into Prince Charming. It is well tailored and fully lined. In addition to Yorkshire Terriers, this costume is ideal for the Pomerian and Chihuahua. Size XS best fits neck girth: 9" breast girth: 14", and body length: 11.5". Red Bow Wide: 3", Black Tie Length: 4.75"
We will make your prince charming look amazing for the "Special Day"! 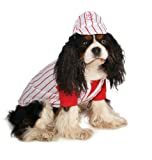 Rubie’s Costume Halloween Classics Collection Costume is a red baseball player costume that features a striped jersey and tie-on hat. It is designed for small breeds including Yorkshire Terriers, Pomerian, Chihuahua and Australian Terrier. The Biker Dog Pet Costume offers the perfect way for your pup to channel the freedom and spirit of bikers. It is an excellent way to show the neighborhood just how great a daredevil your Yorkie can be. The costume consists of a black faux leather coat and hat. 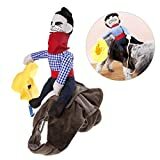 If you can’t help loving cowboys, dressing up your yorkie as one with the UEETEK Pet Dog Costume Cowboy Rider Style will be a blast. Available in three sizes, it is made with denim and has a soft, breathable design. It transforms your pup to a humoristic horse and includes a cowboy cosplay coat with hat. Made of denim, soft and breathable. This cool costume design turns your pet into a humoristic horse. 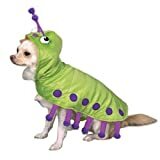 The Zack & Zoey Cutiepillar Pet Costume is a plush green costume that features authentic details spots, bug eyes, and antennae. It fits easily thanks to Velcro tabs at the neck and belly. There is also a leash at the back. The costume is made from 100% polyester and comes in two sizes. 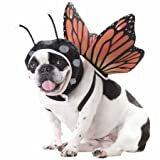 The Animal Planet PET201 Butterfly Dog Costume is another insect-themed Halloween costume we love. It includes printed foam wings and headpiece with antennae. The headpiece is secured beneath the arms. The Rubie’s Costume Ghostbusters Movie Collection Costume is available in four sizes. It consists of a Ghostbuster pet shirt and an inflatable backpack A Stay-Puft Marshmallow Man version from Rubie’s Costume is also available. This costume includes shirt, and backpack. This is an officially licensed Ghostbusters costume. The California Costumes UPS Pal Pet Costume is made from 100% polyester fabric and filled with 100% polyurethane foam. It’s a shirt with sleeves for the front legs and Velcro for secure fastening around the back. There are stuffed arms on the front of the shirt with Velcro dots for holding the UPS box. Also included is a foam visor with an elastic chin strap. If you are all about religion and honoring the Pope, the California Costumes Collections Holy Hound Dog Costume is worth considering. Available in four sizes, it includes a printed miter headpiece, detachable stole as well as a red and white printed costume. Halloween is all about pumpkins, so why not dress your Yorkshire Terrier in one? The Zack & Zoey Pumkin Pooch Dog Costume is a great choice. 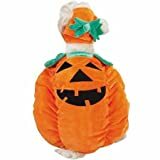 It is made from 100% polyester and features a soft jack-o-lantern design. You also get a matching pumpkin cap, which has a Velcro chin strap for a snug fit. Go back in time with the Rubie’s Pink Fifties Girl Pet Costume, which includes a striped dress with a pink skirt. It comes with a matching costume headpiece made with soft pink fabric and bow. The costume comes in four sizes to fit different dog breeds. The Rubie’s Police Dog Costume features a Velcro closure, a hat and belt with attached accessories. It comes in four sizes and makes a perfect choice if you or your kids are wearing prisoner costumes. The blue shirt is decorated to look like an authentic police uniform. Includes: Shirt, Hat, Belt, Radio And Handcuffs. As you can see, there are so many choices when it comes to Halloween costumes for Yorkies. Whether he is a foodie, loves superheroes or want to pay homage to the hardworking men of law enforcement, there is something to suit all tastes. Previous Can Yorkies Eat Eggs?